Here are some professional pictures from Lauren and Daniel's wedding on, yes, 7-11 (hence the pic in front of everyone's fave convenience store). I am so in love with these images! As I told you before, the "Brothers Wright" use film to shoot their weddings, allowing a much different feel than the digital that has become standard. 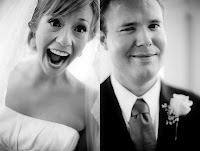 Lauren and Daniel were sincerely one of the nicest couples I have ever worked with. Lauren was so sweet, and geniunely enjoyed her day. I highly recommend this team of brothers for your wedding! Check them out!